The first thing we need to get out of the way is that this is a quartz watch. I wrote a bit about my evolving thinking about quartz versus mechanical watches, here. Basically, the lack of accuracy and the delicacy of mechanical movements can make bad options for watches when used particular ways. More than that, I wanted something which could be a better everyday watch, which can blend in many circumstances, while looking sharp. This is where the Steinhart Ocean Vintage Military failed me: has lovely as the watch is, it really only worked with a couple NATO straps and the bracelet it came on. But it had one feature I didn’t want to lose: great lume on the hands and dials. I could read the time at 4am without squinting. Naturally, this brought about Lum-Tec, and while they do offer mechanical variants, the quartz options were what was available at the time I ordered. I chose the B38 since I have no other black PVD coated watches, nor did I have a GMT. And I really wanted a GMT. 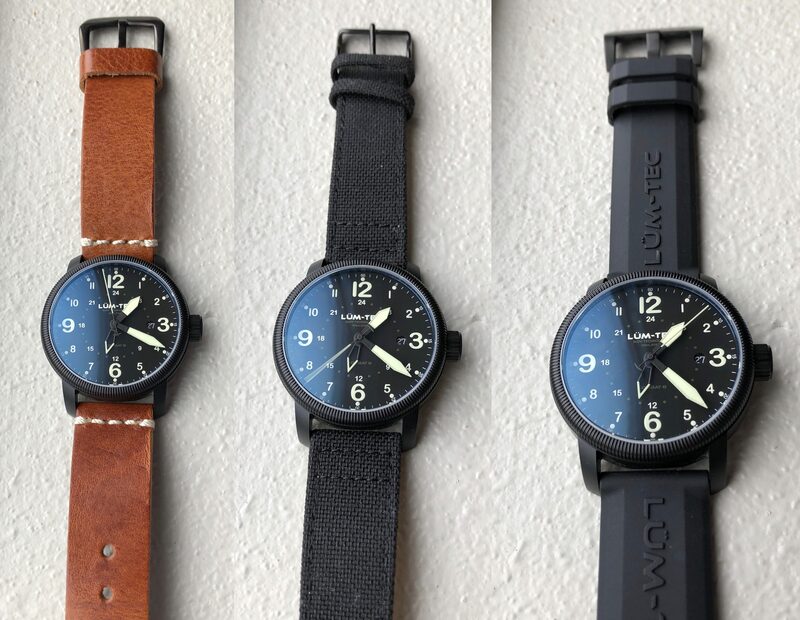 Lum-Tec is known for their lume — they are known to have some of the brightest watches on the market. I was pretty happy with the Steinhart Ocean Vintage Military lume, and the ability to easily read the watch in the wee hours of the morning without extra light to help. With the B38 I am blown away by the lume. If I come inside, during the day, from the watch having been in the sun the lume is glowing bright enough to be seen in a house full of light. I’ve gone to bed, many hours after sunset, and pulled the sheets up over my shoulders, and then looked at my wrist and I can see the lume glowing through the sheets on the bed. At 4am, when you look at the lume, it’s perfectly legible. The only dials I can’t make out at that hour are the GMT and second hands. I don’t think it’s possible to overstate how bright and long lasting the lume on this watch is. Perhaps the only thing which could beat it is tritium tubes on the watch face. It’s aces. I’ve been wanting a GMT watch (which allows you to see two time zones at once) for quite some time. Since I travel fairly often I thought it would be great to be able to see home time without doing the math in my head. In practice, a GMT function is better in theory than in function. It’s takes just about the same amount of time to read off the GMT time (since it’s operating on a 24 hour scale) than it would to just add or subtract a handful of hours in my head. As of now, I keep GMT set to local time. It adds nothing to the watch, but it also doesn’t take away anything. I guess it could theoretically make it a bit easier to use the watch as a compass (point GMT hand at the sun, and 12-position will point north), but that seems like an even stronger gimmick than GMT itself. I’d much rather have a world-time watch I think, or something with a “jumping” hour hand. What surprises me the most about this watch is just how versatile it is. The PVD case and black dial worried me that it might not be as versatile looking as the Steinhart, but I actually think it is more versatile than that Steinhart. This makes the watch incredibly versatile: good for outdoors, good for casual wear, and good for swimming too. With 200m of water resistance, you’d be hard pressed to find any activity the watch won’t hold up well too and the silicone band is pretty comfortable even when swimming and getting it wet. The thing is: there’s nothing about the movement I love and there’s nothing about it I hate. I can’t hear it tick at night, and I don’t ever find myself staring at it. It’s what a watch should be: pretty accurate with plenty of utility (Lum-Tec has a system for anti-shock mounting as well). There’s a lot of snobbery in the watch community about quartz, where many believe that a quartz watch (the vast majority of watches mind you) are not as good as a mechanical movement, with the rare exception of what is called a “high accuracy quartz”. Which is a bit absurd. For one quartz movements are typically vastly more accurate than a standard mechanical watch (they typically lose or gain about 15-25 seconds a month, whereas mechanical might lose or gain 5-10 seconds a day). Quartz watches are also typically more durable, as mechanical watches have a lot of moving parts. Oh and servicing a mechanical watches is hundreds of dollars, whereas servicing a quartz is the cost of a battery — though Lum-Tec has free service and battery changes for life. So yes, this is a quartz watch with about as average of a movement as you can get, but I’ve almost come full circle to like quartz watches more than mechanical. Because you know what’s really annoying? Knowing that you should adjust the time on your watch daily instead of every few months. I really have come to not like the idea that it’s tolerable to be losing seconds a day in accuracy and somehow that’s ok because there’s a highly complex bit of machinery moving the hands. There’s a ton to love about this watch, from the lume and the durability to the warranty and company behind them. Not to mention the looks, I love the way this looks. 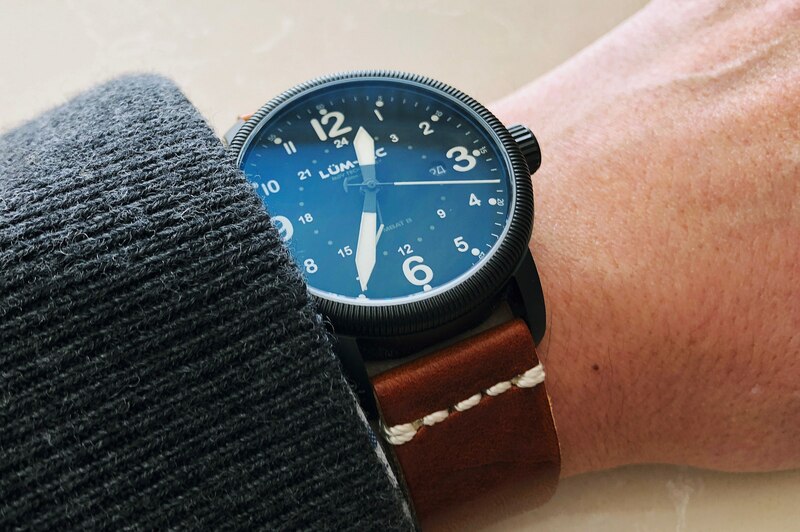 But there’s also downsides, at $500 for a quartz watch it can be a stretch — but what you’re paying for is lume that sets the bar for all other watches and a well designed and durable watch. Or put another way, as stated on a watch forum when asked if Lum-Tec was worth the price: ‘absolutely, they are a hell of a good company’. I agree. I’d forgo the GMT if I were to do it again, but otherwise I have next to no complaints about this watch. It’s also neat that they are limited to roughly 200 pieces for each model. You can get one direct from Lum-Tec, or from Amazon. A new go to watch for me.